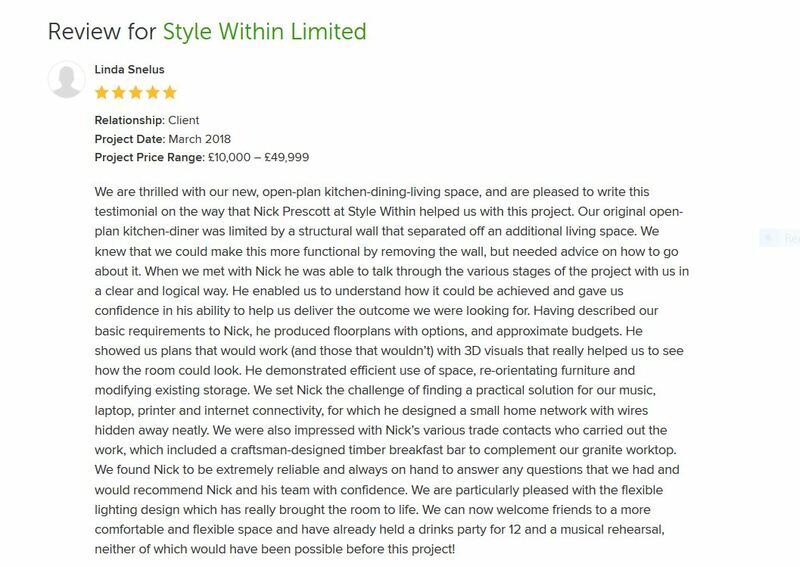 We are thrilled with our new, open-plan kitchen-dining-living space, and are pleased to write this testimonial on the way that Nick Prescott at Style Within helped us with this project. Our original open-plan kitchen-diner was limited by a structural wall that separated off an additional living space. Linda & Mark, Bath. 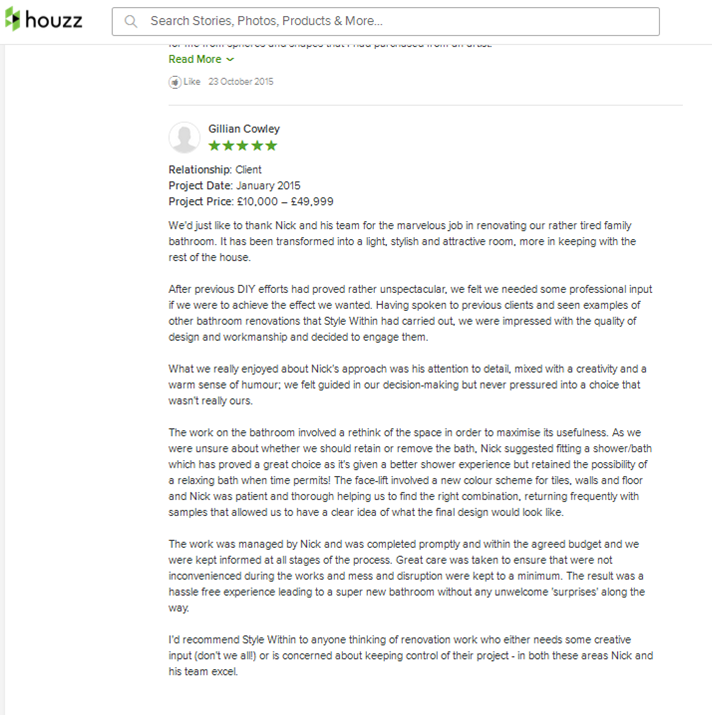 Read full on-line Houzz review here. We are particularly grateful to Nick Prescott at Style Within for creating a new design for our teenage son’s bedroom, and for overseeing its remodelling, decoration and furnishing. It was really great just to let him design and manage everything for us. Gita & Saiful, Bath. 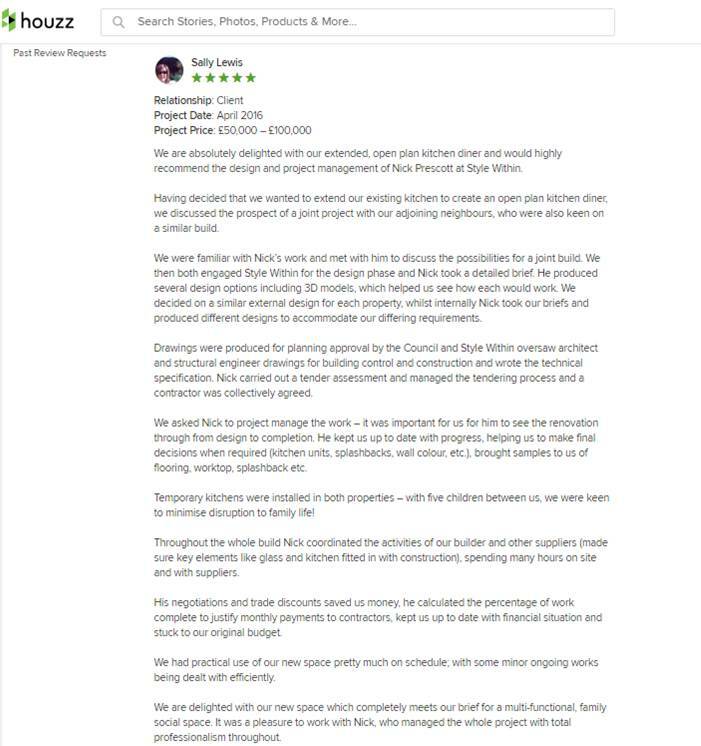 Read full on-line Houzz review here. I Wanted to thank Nick at Style Within for his help in designing our new 5 bedroom modern house we are about to start building in Thailand, I gave him some basic concepts and he turned these in to 3D models. Andrew & Vivi, Frome. 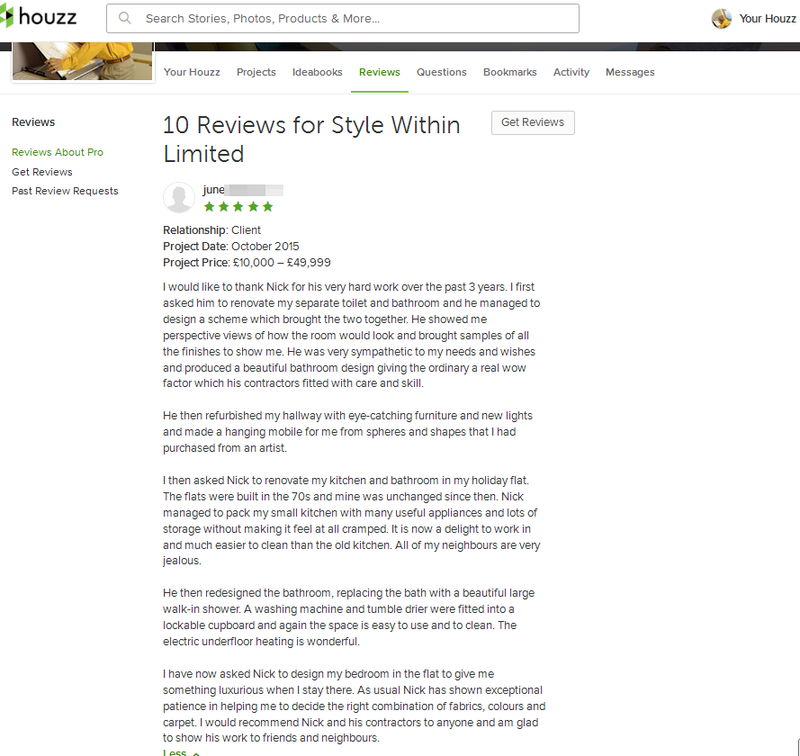 Read full on-line Houzz review here. Sally & Mark, Bath. 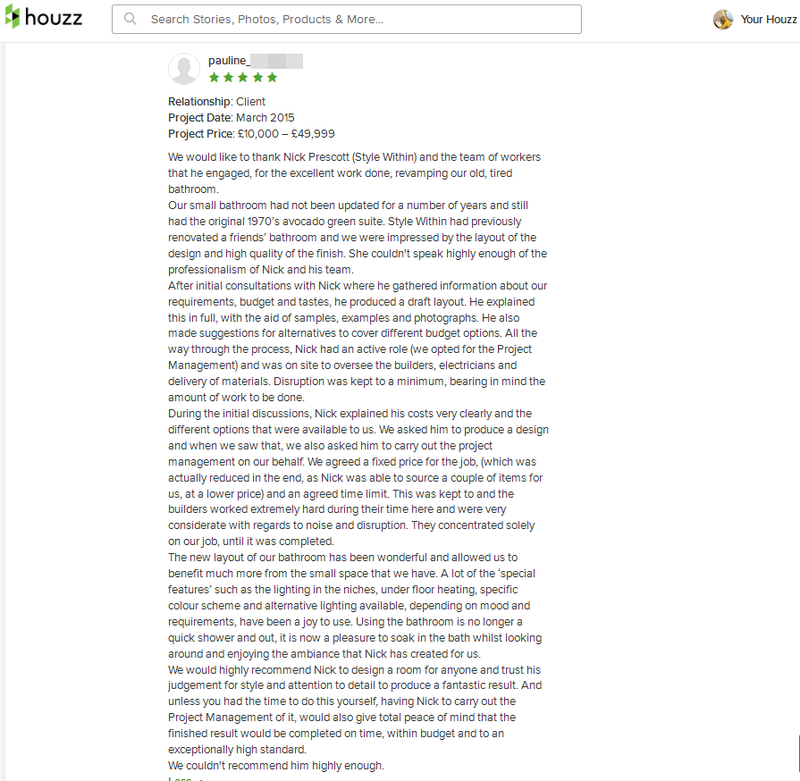 Read full on-line Houzz review here. 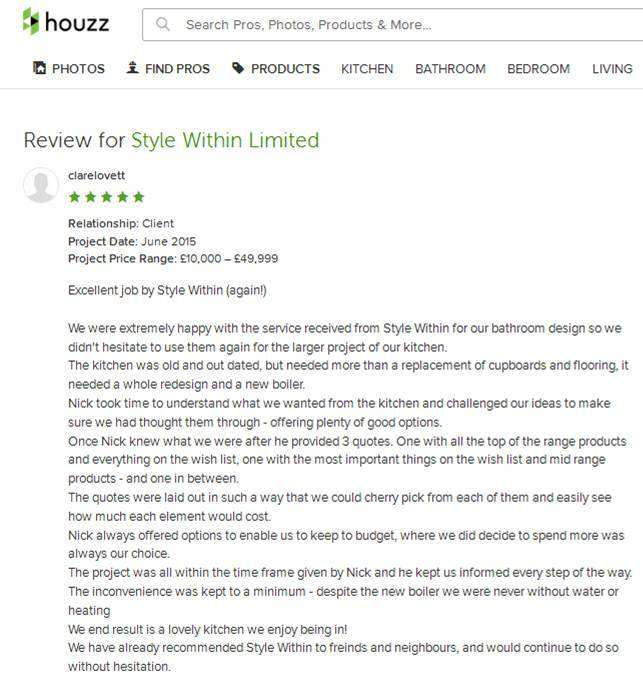 We were extremely happy with the service received from Style Within for our bathroom design so we didn’t hesitate to use them again for the larger project of our kitchen. The end result is a lovely kitchen we enjoy being in! We have already recommended Style Within to friends and neighbours, and would continue to do so without hesitation. Clare & Paul, Bath. Read full on-line Houzz review here. 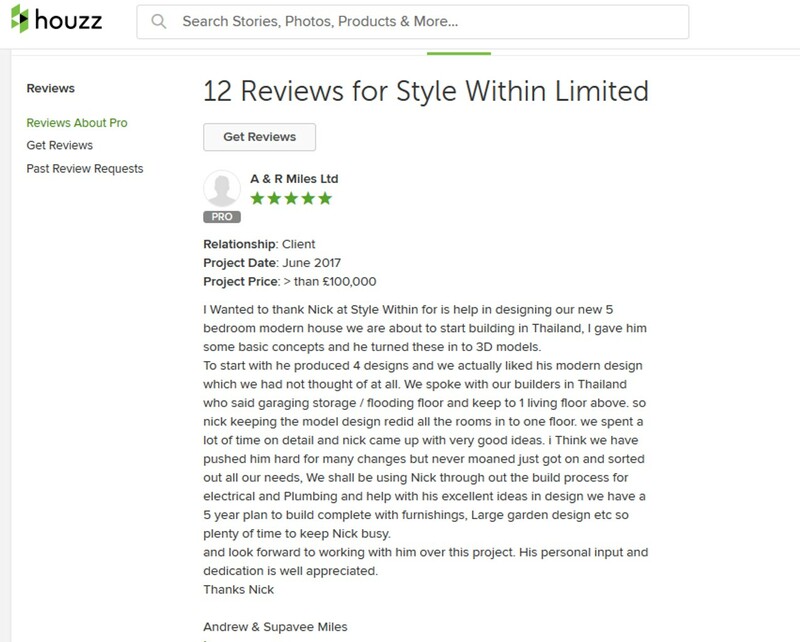 We wanted to express our thanks to Nick Prescott of Style Within and to recommend his interior design and project management service to others. We could not have produced such a successful renovation of our home without his professional support. With no experience of what to expect from major surgery to our house, we were very grateful for Nick’s oversight and control of all aspects of the work. His advice, management and, ultimately, his design flair has produced for us a home with a stunning, practical interior. Andrew and Gillian, Bath. Read full testimonial here. Our bathroom is now not only aesthetically pleasing but ‘works’ – great lighting, storage and comfort. 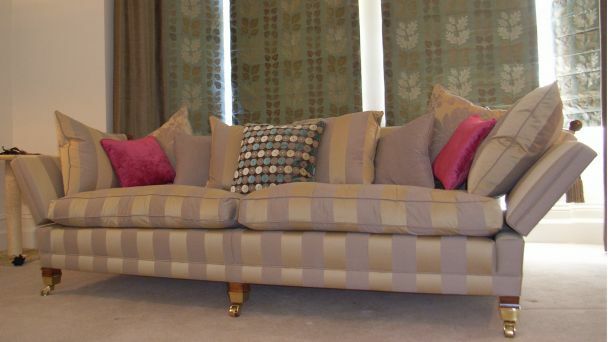 We would happily recommend Style Within for a hassle free project with great results. Clare and Paul, Bath. see email. We would like to thank Nick Prescott (Style Within) and the team of workers that he engaged, for the excellent work done, revamping our old, tired bathroom…. We couldn’t recommend him highly enough. Pauline and Richard, Atworth, Wiltshire. Read Full on-line Houzz Testimonial here. I need to pinch myself at times to see the place as it is now, remembering what it was like for so many years. I am more than happy for Nick to show it off to prospective clients. It really is spectacular, and it would be gratifying for me to hear when others benefit from the high levels of professional advice and service that Nick has brought to my home. Steve, Bath. Read full testimonial here. Working with Nick on this project has been a pleasure. He is a man of firm opinions and convictions, and his tastes in furnishings and décor are clearly rather more radical than my own. This however only added value and I am grateful that he persuaded me on many occasions to be less conservative than would be my natural inclination. On the other hand he would always respect my wishes with a good grace if I could not be persuaded. His project management skills are excellent and he is extremely hard working, reliable and conscientious. I have no hesitation in recommending him. Jeremy, Bristol. Read full testimonial here. Many thanks for your help in getting the place looking great. I think it is an outstanding look and feel. Let me know your mailing address, will you, as I want to send a card to you and your family. We would have to agree that we are very pleased with the end result. We’d just like to thank Nick and his team for the marvelous job in renovating our rather tired family bathroom. It has been transformed into a light, stylish and attractive room, more in keeping with the rest of the house. The work was managed by Nick and was completed promptly and within the agreed budget and we were kept informed at all stages of the process. Great care was taken to ensure that were not inconvenienced during the works and mess and disruption were kept to a minimum. 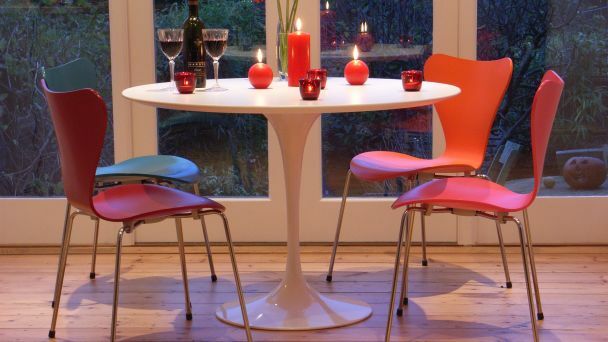 I’d recommend Style Within to anyone thinking of renovation work who either needs some creative input (don’t we all!) or is concerned about keeping control of their project – in both these areas Nick and his team excel. The whole place looks really good, I am very pleased, thank you very much for doing it for me. I was extremely pleased with the work – Nick sent me frequent updates on the budget and was able to suggest good value products and savings which I found re-assuring. Nick was very strict on the work to be completed before agreeing any monthly payments for his contractors, so I always felt in control even though I knew that it was actually being managed at the other end of the M4. I also found Nick’s contractors extremely friendly and hardworking and when I visited they were able to explain the progress of the work and how various problems had been overcome. 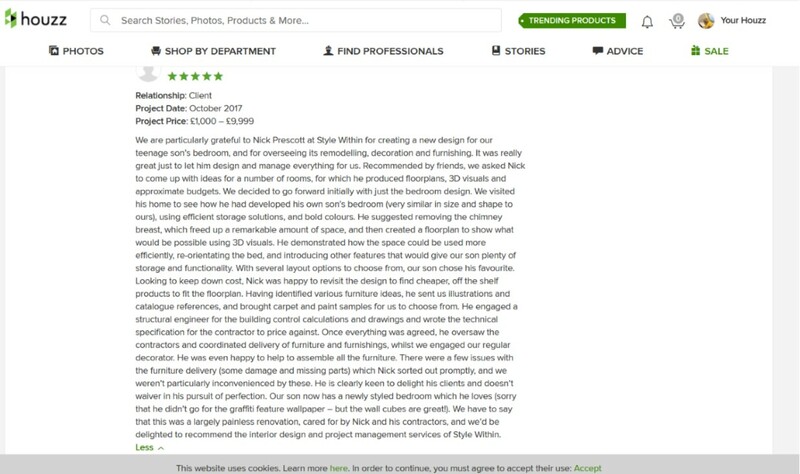 I can certainly recommend Nick to others with confidence. Roger, Bath. Read full testimonial here. Annette, Bath. Read full testimonial here. I would just like to take this opportunity to thank you for your hard and creative work in helping to plan and design our new office. Whitfield Nash Residential Sales, Bath. Read full testimonial here. I feel the colours are completely right and that you have cleverly ‘caught’ my feelings and ideas. Patricia, Bath. Read full testimonial here. I would like to thank Nick for his very hard work over the past 3 years…I first asked him to renovate my separate toilet and bathroom … I then asked Nick to renovate my kitchen and bathroom in my holiday flat …. I have now asked Nick to design my bedroom … I would recommend Nick and his contractors to anyone and am glad to show his work to friends and neighbours. June, Atworth, Wiltshire. 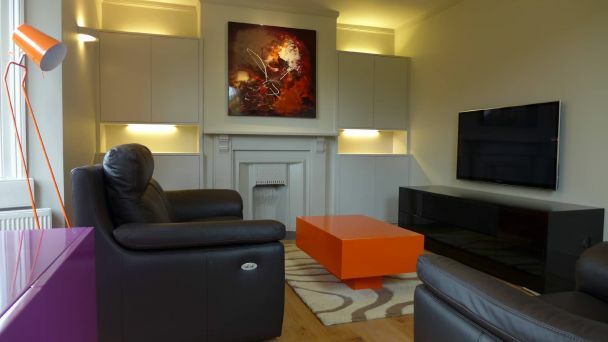 Read full on-line Houzz testimonial here. Just to say a really big thank you for all your inspiration, ideas and hard work. Sharon & Paul, Bath. Read full testimonial here. Derek & Jenifer, Bath. Read full testimonial here. We look forward to using your services again in the future and will continue recommending you to our friends. Emily and Salim, Bath. Read full testimonial here.